I think the idea for this cake came from the Washington Cake recipe which was made the same way as this but with jam in the middle instead of chocolate cream. Dessert recipes from the vintage era rely on the use of much less sugar than we are accustomed to today, I saw this when I lived in the Philippines as their desserts are much less sweet than the equivalent American recipe. Pre Heat oven to 350° and place rack in 2nd lowest position. Line 2 cake pans with parchment on the bottom and grease and flour the sides. Cream Crisco, egg yolk and sugar until well blended. Sift together flour, salt and baking powder then add to creamed mixture alternating with the milk pausing to ensure it is well blended before adding the next bit of flour and milk. Finally fold in the egg white. Divide batter between the 2 prepared pans and spread evenly before baking for 35mins until toothpick inserted in center comes out clean and top is evenly browned. Remove pans to cooling rack. In a bowl combine flour and cold milk and stir until it's a smooth paste then add to hot milk in pan and cook until smooth and thick (about 5 mins). Melt chocolate in double boiler (or microwave) then add sugar, temper with a little of the hot mixture in pan then combine in pan. Cover and cook on lowest setting 10mins. Combine yolk and egg and beat well. Add in a little of the chocolate mixture to temper then add into pan and mix until smooth. Remove from heat and let stand 5 mins before stirring in vanilla. Place one cake on plate then spread evenly with chocolate mixture and top off with other half of cake. Dust liberally with powdered sugar before serving. Looks delicious! 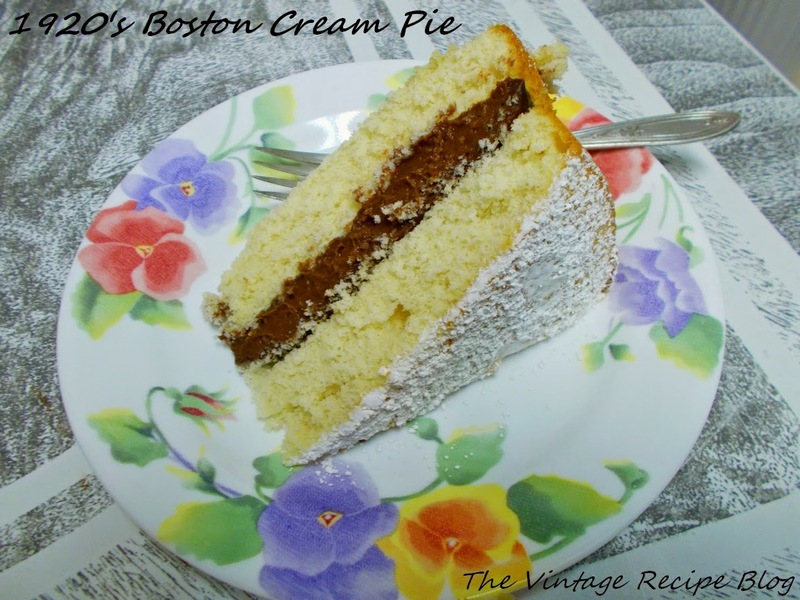 I like the idea of a chocolate filling for boston cream pie.